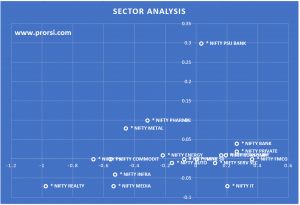 Presently Nifty Pharma Index has been swelling and outperforming all other indices and Nifty itself. The sectoral analysis chart (below) suggests that the Pharma Index is ready to breakout and begin a new journey to the North. 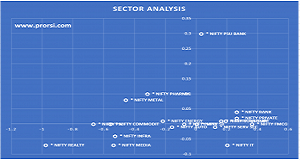 A close look at the Index chart also suggests that the breakout in the sector has taken place and the related stocks are getting ready to fly. We have selected a handful of LARGE CAP pharma stocks that have already registered a breakout from their respective bear zone and have initiated their journey up. DR REDDY’S LAB: The stock has moved up very fast and the candles are suggesting unadulterated buying. The RSI has well moved into the bullish zone further boosting the move with momentum support. A very strong supply zone has been breached and the stock is all set to move to 2600 levels. Though the stock may fumble a bit at 2250 levels, but it will provide an opportunity to add onto the positions. GLENMARK PHARMA: Another large cap that took the supply zone out was Glenmark Pharma. The move took place with a huge bullish candle, this depicted buyers were all around the stock throughout. The stock is expected to continue its winning streak in the coming sessions. In the near term levels of 640 will serve as a good target zone followed by 740 levels. LUPIN LAB: Well there is no surprise that all the pharma stocks are displaying the same chart pattern. This stock closed above a very strong double bottom formation. The move was very strong accompanied with volumes. A shaven head candle suggests only buyers in the stock. The RSI moved heads up in the bullish area and thereby momentum have also supported the move. In the coming sessions the stock is expected to meet 960 and 1070 levels. SUN PHARMA: A stock needs Price, Momentum and Volatility to move, all three components were present here. The moves are impulsive and explosive. Almost killing every bear in it, RSI moved into the bullish range and a close above an important supply zone indicates the trend course have changed. The prices are expected to keep moving North towards 570 and 610 levels. Other stocks like Granules India, Ajanta Pharma & Strides Sashun have also moved up, but the prices are still to mature. We will have to wait for a proper break of important supply zones plus RSI indications of the trend change.